On October 23rd researchers from the Istituto Italiano di Tecnologia (IIT) came to University of Skövde to discuss Human-robot interaction and to visit and be inspired at ASSAR – Industrial Innovation Arena. IIT-RBCS has a long lasting activity on social robotics with special focus on investigating the role of social signs (such as gestures’ dynamic parameters and gaze direction). So on October 23rd the AIR consortia opened up the talk held by IIT to researchers. The visiting researchers were Giulio Sandini, Alessandra Sciutti and Francesco Rea from the Robotics, Brain and Cognitive Sciences unit at IIT, in Genova, Italy. The researchers gave the attendants an insight to both the cognitive basis underlining social interaction and how social skills in robotics can be designed and implemented on the humanoid robot iCub to promote natural human-robot interaction. Francesco Rea, Alessandra Sciutti and Giulio Sandini from the Robotics, Brain and Cognitive Sciences unit at IIT. Social robots that in various ways are able to interact and relate to humans are trending. At the University of Skövde, there are currently several research projects where researchers are studying how the skills of social robots can be put into use. For example within the industry. On May 15th 2018, Pepper, the University of Skövde’s robot and an eight year old girl Rut opened one of Sweden’s largest industry trade fairs. They cut the ribbon together, as a symbol of next generation’s industry coworkers. Pepper was invited to Elmia Production Fair on May 15-18 to open the event, and was described as “the latest within technology and industry”. Together with his colleagues, Erik Billing, lecturer in Information Technology at the University of Skövde, has programmed Pepper’s movements and expressions. – Pepper and eight year old Rut opened the fair by untying a ribbon. Afterwards, Pepper was available for visitors who wanted to say hello and learn more about social robots, and our various research projects in this field at the University of Skövde, says Erik Billing, and he also mentioned the various applications of the robot beyond acting as an opening speaker. In the research project AIR, a joint effort with the RISE research institute, Örebro University and Halmstad University who receive funding from the KK-foundation, the University of Skövde is studying how robots can interpret and interact with various autonomous systems. Some areas that are being studied in addition to social robots are industrial robots and autonomous systems for traffic, that is driver-less cars. – By studying these three areas, we are hoping to gain a better understanding about how humans react and interact with the three systems. Our goal is to create a tight collaboration between humans and robots, where the robot is able to adjust to human actions and intentions. For the industry, we hope that this will open up for new ways of producing goods while contributing to a better work environment for machine operators. The development of social robots such as Pepper has just begun, and the fields of application will most likely expand in the future, says Erik Billing. – Technology from social robots, like how they establish eye contact, process human speech or gestures, is likely to be very important for the future of industry. Halmstad University’s social robot Baxter can create paintings that express human emotions. Last year, Baxter’s paintings successfully participated in an international robot art competition. The emotions were transferred to the robot by brain waves from a famous Swedish artist, Peter Wahlbeck. This year, the robot art has reached the next level – Baxter has learned to paint as a performance, showing emotions itself and infusing these feelings into artwork. Winning sixth place in last year’s international robot art competition encouraged the Halmstad research team to further develop the social robot Baxter’s emotional artwork. Robot art has also become a compulsory part of the Master’s Programme in Embedded and Intelligent Systems at Halmstad University. – Last year, Baxter painted with a frozen, blank face. Only the paintings expressed emotions, so it was like a computer printer just printing images. This year we wanted the robot too to show emotions, says social robotics researcher Martin Cooney. In order for social robots to successfully interact with and help humans, they need to be given “life”, complexity and randomness. Martin Cooney and his fellow researchers at the School of Information Technology want to be more creative and innovative in their development of social robotics, and robot art is one example of this. – Robots in factories might follow rigid programs – do this, do that.. But that’s not how humans work. In order for social robots to successfully interact with and help humans, they need to be given “life”, complexity and randomness. The robot has to be able to both sense human emotions and express feelings of its own – just like humans do, says Martin Cooney. Six paintings from Halmstad University have been sent to the 2018 International Robotic Art Competition. A team of 24 Master’s students created the backgrounds of all paintings by using random movements of small platooning robots. The foreground was painted by Baxter, programmed to show a certain emotion through its ‘face’ and sound. Martin Cooney and Baxter at the robot art competition last year when Baxter created paintings that express human emotions. This year, Baxter has learned how to show it’s own feelings through art. Baxter lives at Halmstad University where he is in training to understand and interpret people’s needs and emotions in order to help them in different ways. Baxter can also be useful when you are cooking to make sure the food is healthy, or help you when you fall. The base of the robot, “Ridgeback”, is from Clearpath Robotics. The top, “Baxter”, is from Rethink Robotics. The robot was purchased with support from the Swedish Knowledge Foundation for the SIDUS AIR project, which focuses on action and intention recognition in human interaction with autonomous systems. 200 works of robot art divided between 38 teams from 10 different countries competed in the international Robot Art Competition. The winners were announced earlier this week and the social robot Baxter from Halmstad University, and his emotional paintings, came in sixth place. HEARTalion (Halmstad University Emotional Art Robot) was top six in the Robot Art Competition, receiving high acclaim for the results of the Master’s project where a social robot like Baxter is being trained to pick up on and interpret human emotions through art. “If this body of work was exhibited at a gallery and I was told that the artist aimed to capture emotion through colour, composition, and textures – I would buy it (says one of our professional judges). The bold brush strokes, cool or warm templates to match the emotional quality expressed, it all made sense – but felt alive. Loved them”, reads the jury motivation. Dan Koon, one of the artists who have been coaching Baxter and his team during this project sees it as a breakthrough for unique research. Martin Cooney, researcher in Social Robotics at Halmstad University and supervisor for the Master’s project is proud of the teams work, earning sixth place and a prize sum of $2,000. ”I think it’s really cool that our robot’s work was well received and that we will even get a bit of money, also because our team members worked hard and were pretty serious about this idea of somehow trying to do something with art and technology that could potentially help someone in the near future”, says Martin, also sending his thanks to the people involved in the competition. Soon the students, Sowmya Vaikundham Narasimman and Daniel Westerlund, will defend their Master’s thesis, and the robot team will continue to look at new possibilities for the social robot, who’s single goal is helping people and making them feel better. For the team, who came in ahead of, among others, MIT in the Robot Art Competition, cake is on the menu. “There has also been some talk about celebrating, maybe with some cake or pizza, which I think should definitely be followed up on”, says Martin Cooney. Can a robot sense your feelings? Right now 198 works of robot art are competing in a Robot Art Competition in the USA. The winners are selected partly by Facebook likes. 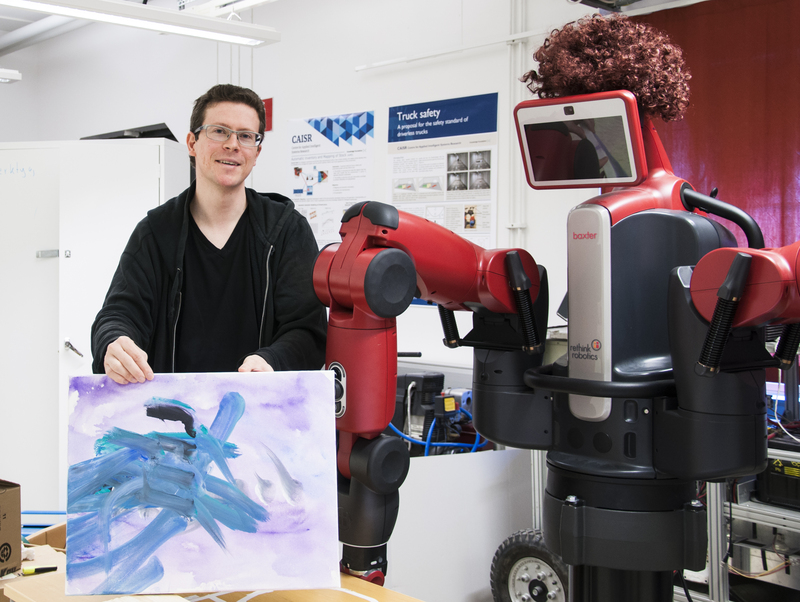 A unique contribution to the competition comes from Halmstad University, where the robot Baxter has attempted to interpret human emotions through painting, coached by artists Peter Wahlbeck and Dan Koon. Usually Baxter lives at the School of Information Technology at Halmstad University, where he is in training to understand and interpret people’s needs and emotions in order to help them feel better. But one day a few weeks ago, Baxter took part in a public event well suited for a social robot. People had gathered on campus to see Baxter try to read, interpret and draw the feelings of well known local artist Peter Wahlbeck, also assisted by artist and author Dan Koon. They have both been part of Baxter’s training by coaching the robot research team in an ongoing master thesis project where the robot is trained to pick up on feelings and express them through painting. Baxter, who had taken the name ”Rob Boss” fort the art competition, met his audience blindfolded. “We did it to show that this is not about the robot reading facial expressions or body language. A person can smile without being happy. So we want to take it one step further by getting the robot to sense emotions through brain waves, to understand how a person truly feels,” says Martin Cooney, researcher in social robotics at Halmstad University. The robot reading Peter Wahlbeck’s emotions painted his impressions with a bright happy yellow and a dark blue and black. Even though the robot chose colours to represent the ”right” emotions, Dan Koon was disappointed after the public event, seeing the robot perform at a more advanced level before. “Baxter had stage fright today, the robot has done better on other occasions. But we still think that the event has proved what a large potential this research has,” says Dan Koon. “It is positive that the robot chose the colours matching the emotions, according to the colour scheme we have been using. It makes for a promising future,” says Martin Cooney. 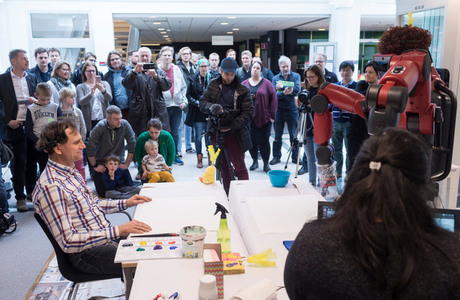 The public event was not the first time Dan Koon and Peter Wahlbeck painted with Baxter – and the images entered in the Robot Art Competition are from those other occasions.